Hello dear students, welcome to our website BDclass. It’s not only a website but also an educational institution. 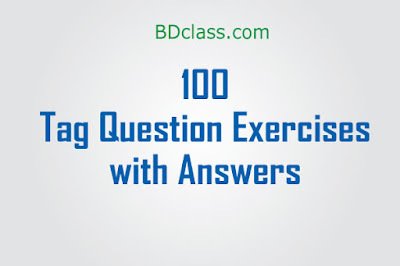 Today I am going to share 100 question tags example with with answers for S.S.C examination. I think this will help you to cut a good result on tag question. You can download question tag examples sentences in pdf format. The baby is innocent, isn’t it? Nothing comes out of nothing, does it? The glass contains little water, does it? In our class everybody knows everybody, don’t they? The mother rose in her, didn’t it? None can do this, can they? I am happy, aren’t I? The universities have opened recently, haven’t they? They have tried but failed, haven’t they? Everyone should respect the teachers, shouldn’t they? The team is qualified, isn’t it? He never goes out with his dog, does he? She could have been more discreet, couldn’t she? He locked the papers in the safe, didn’t he? For the boys the task was easy, wasn’t it? You broke the machine, didn’t you? Come and see me tomorrow, will you? He can go to college by bus, can’t he? The girl cried for help, didn’t she? We didn’t play very well today, did we? Banks close at 4 p.m., don’t they? He is trying to give up smoking, isn’t he? The girl broke the cup, didn’t she? Sohrab was a brave man, wasn’t he? She often visits her home town, doesn’t she? He always lags behind, doesn’t he? You forgot my birthday, didn’t you? Arman is taller than Omar, isn’t he? You are talking the admission test, aren’t you? Bangladesh cricket team won the match over Sri Lanka, didn’t they? She won’t dance in the party, will she? You won’t eat it, will you? I am just hopeless at telling jokes, aren’t I? The moon shines at night, doesn’t it? He used to visit you regularly, didn’t you? The teacher will help the poor student, won’t he/she? She knows you, doesn’t she? He was not watching the cricket match, was he? Let’s go to a picnic, shan’t we? Saidul Islam writes in English, doesn’t he? Let’s have a cup of tea, shall we? Birds can play, can’t they? He’s got a prize, hasn’t he? What a pity!, isn’t it? I need a pen, don’t I? He needs a pen, doesn’t he? We may fail at first, mayn’t we? We must take care of our health, mustn’t we? Bangladesh is a democratic country, isn’t she? ‘I’ is a vowel, isn’t it? The rich are not always happy, are they? Raya told me the matter, didn’t she? Most of you know French, don’t you? If you come, I will go, won’t I? He said that he would do the work, didn’t he? Let him do the work, will you? They used to play football, didn’t they? He as well as his friends has done the work, hasn’t he? Jack is short but his brother is tall, isn’t he? The earth is round, isn’t she? One should do one’s duty, shouldn’t he? It has hardly rained at this summer, has it? Don’t boil rice, will you? Kindly, do me a favor, would you? No, I don’t believe this. You know he is very honest, isn’t he? Neither of them went, did they? Cricket is a very exciting game, isn’t it? People of all ages enjoy the game, don’t they? At present cricket is the most popular game in our country, isn’t it? People of all classes enjoy playing it, don’t they? Bangladesh is a test playing country but its standard is not high, isn’t it? Patriotism inspires a man to shed last drop of blood to defend the freedom of his country, doesn’t it? A true patriot is honored by all, isn’t he? Unfair means in the examination is an offence, isn’t it? It degrades the standard of education, doesn’t it? An educated man cannot support unfair means in the examination at all, can he? Bangladesh is a land of rivers, isn’t she? They’d gone to Chottogram, hadn’t they? I’d meet you, wouldn’t I? Sabina was sleeping, wasn’t she? How sweetly the bird sings, doesn’t it? Don’t forget me, will you? Let’s do the work, shall we? Let them do their work, will you? They will not go to school, will they? He has not done the work, has he? The boy does not play, does he? I don’t need any help from you, do I? The girl does not need any tutor, does she? You needed a blanket, didn’t you? All of us attended the meeting, didn’t we? There were many problem, weren’t there? Some of you can speak well, can’t you? She had a pen, didn’t she? You should obey your teachers, shouldn’t you?